Thank you to all the readers of the THE SHROPSHIRE STAR who responded to my letter and subsequent article by Toby Neal. The latest addition comes from Arthur Osborne who was seven at the time of the crash. His father attended the scene as a fireman, and Arthur has sent me a copy of his father's diary entry for 2 January 1944 (see below). Arthur and his brothers also recovered a gold cufflink with initials JDW from the scene, and I am investigating that further. Relatives of Robert Reeder still have over 100 letters that Robert wrote to his girlfriend Valerie, and we have photos of them together. Scanning 100 letters takes time but I will add to Robert's story once I have the family's agreement. In the meantime Robert will be one of the 118 servicemen remembered by the people of Banstead at this Sunday's service at the War Memorial. Fleet Air Arm H.M.S. Godwit Royal Naval Air Station, Hinstock. Son of Charles Edward and Clara Reeder, of 4 Wilmot Way Banstead. Robert attended Sutton County School in 1937 and 1938. During the Second World War, HMS Godwit was a training school for the Fleet Air Arm - one of many around the country, often inland and close to RAF airfields. The main resident unit was 758 Squadron, the Naval Advanced Instrument Flying School. Detachments were sent to the main specialist flying schools at Crail, East Haven Fearn, Hinstock and Yeovilton to provide a short instrument flying course for pupils. By 1944 it had over 100 Oxfords, and other types were also in use. A key skill which pilots learned at HMS Godwit was to fly "blind" using the Lorenz Beam Approach. This was done by training them to follow the sound of a radio beam transmitted from the airfield. As the plane followed the beam, the crew would hear a steady note, and if they strayed to left or right they would hear either dots or dashes depending on which side they had strayed. There were also other tones to help pilots approach the runway. This was the beginnings of the blind-flying system still in use today. 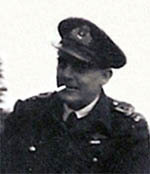 The flying school was the brainchild of Commander John Pugh who could see that a new strategy was required to reduce the significant losses suffered by the Combat Air Group. Despite firm opposition, John Pugh succeeded in convincing the right authorities and set about looking for the best pilots to act as instructors. 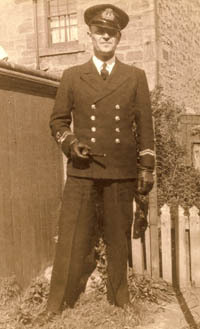 One such person known to John Pugh was Jimmy Watson, and Pugh succeeded in getting Watson into the Navy without Watson having to become a 'sailor' first. Watson was a brilliant flyer and had taken part in the 1938 air race from Cardiff to London. On that occasion, he also took his young son, David, and they were only just beaten into second place by none other than Geoffrey De Haviland. Lt Commander Watson's role at the flying school was to instruct pilots to use the new Beam Approach which was so much more critical to Navy pilots who had to land on a moving aircraft carrier, probably many miles away from the location it was at when they took off. Many of the trainees had seen active service and were not impressed by having to return to school, hence instructors often took them to an area around the Wrekin, a high hill in Shropshire, as this was often shrouded by cloud. The trainees quickly realised they had to pay attention. 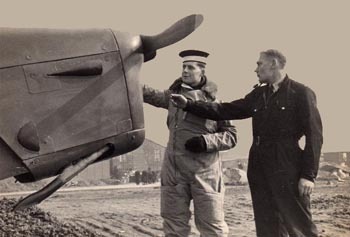 Meanwhile, Robert Reeder had joined the Navy as a naval rating and the photograph shows Robert wearing his service-issue Sidcot flying suit before his commission as a Sub-Lt. As a pilot trainee, he is being introduced to one of the RAF's and FAA's (Fleet Air Arm's) trainer aircraft, a Miles Magister powered by a gypsy major engine. Robert was a copious letter writer and regularly wrote to the girl he loved, Valerie Sleep. He missed her very much and counted the hours till he could see her again. Whenever he could, he would apply for leave just to be with her for a few hours. Valerie kept every single letter written by her 'Bobby' and the family still have them. Sub Lt Reeder's flight log shows that he was no novice, having recorded about 400 hours of flying by June of 1943. He flew Spitfires on occasions, as well as Gladiators and various others including, whilst with 781 squadron, the Proctor and Vega Gull, Swordfish, Albacore, Warlus, Fulmar, and Seafire. On the 8th of June that year he also piloted a Hurricane. Proctor P6071 - ...781 Sqn...taxying too fast, ran into van parked on peritrack, Cat X 29.4.43 (S/L RC Reeder). Vega Gull P5986 - ...781 Sqn Lee 11.3.43 ('L9H'); collided with banking in dispersal bay, Cat Z 14.8.43 (S/L RC Reeder OK). Despite these incidents, Robert was clearly a very competent pilot, as he was accepted for training as a flying instructor. Lt Commander Watson was to be his senior instructor. Another instructor, Reg Howard, who started at Hinstock in Spring 1944, recalls that such incidents were "not uncommon". Watson, always called Jimmy, was a keen photographer and his many photos are still with the family. Photos of HMS Godwit are rare, but Jimmy did take one for his album. "The beam system was fairly simple to master. The most difficult thing for trainees was getting them to abandon their instincts and trust the beams. This is the way it worked - A transmitter based at the upwind end of the runway sent out a beam of sound in both directions along the line of the runway. It broadcasted a steady note in the centre with dots on one side and dashes on the other. When entering the beam in cloud you had no idea on which side of the airfield you were. The further from the transmitter the wider the beam became, so by flying across it and noting the time it took, then making a controlled turn back through it and comparing the two times, the position of the field was known. So far so good, but it was still unknown from which direction one was approaching the runway. When flying directly over the transmitter there was a moment of silence. At the approach end were two markers sending out signals vertically. One, the Inner Marker, was situated fairly close to the end of the runway. Further out was the Outer Marker. Each gave a distinct signal. Having established in which direction one was flying, there was a set system to follow aimed to bring one back over the Outer Marker at about 400 feet, then to the Inner Marker at 100 feet at which point one hoped to see the runway. It was a simple but effective system.The worst scenario occurred when the beams went off for one reason or another, and in that situation you could find yourself in real trouble if you where flying in cloud, as I can tell you from personal experience." 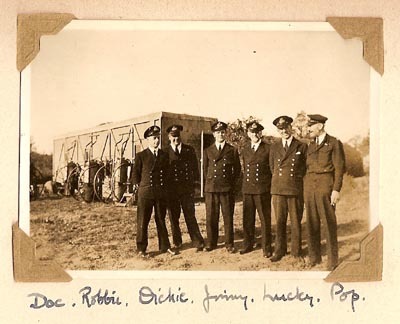 The photo on the left, another from Jimmy's collection shows a group of instructors at Hinstock. He records his own name as Jimmy however amongst this group he was known as "Watty". There were at that time 18 airfields in Shropshire, all in the north of the county and many were training establishments so it is easy to see why there were many accidents. Hinstock had a clean record until the 2nd of January 1944. Watson and Reeder had taken off to do an hour's routine instruction. When they became overdue and could not be contacted on the R/T the alarm was raised. The aircraft was found crashed, and both occupants had been killed. 758 Sqn Hinstock ; Lost control at low level, spun in out of cloud near the Wrekin, Cat Z2 2.1.44 (L/C JCVK Watson & S/L RC Reeder killed). Leonard William Osborne was a local fireman serving with the National Fire Service. His diary entry for 2 January 1944 says " Went out to plane crash Lime Kiln Wood. 2 killed, no fire ". Leonard's son, Arthur was seven years old at the time and remembers the excitement of going to the site with his older brothers to look for souvenirs, as all boys did then. He recalls "We found the site about 30 to 40 feet from the path that runs from Red House farm (or Dormy House, now demolished), alongside the golf course, to Maddocks Hill quarry. It was just inside Lime Kiln Wood. We found what appeared to be an impact site that was an area of soil and mud heavily impregnated with what I later came to know as hydraulic oil. My brothers commented on the lack of tree damage, suggesting a near vertical crash impact. The area had already been cleared so there was not much to find but I caught a glint of a small object in the mud which I picked up. It was a gold cufflink with three initials. The first and the last were definitly J and W. I think the middle initial was a D. JDW in enamel on the oval part of the cufflink . Now, sixty-four years later, I know that one of the pilots killed was James Watson." There are no official records of any investigation into the crash however David Watson, Lt Commander Watson's son has always known the cause, probably because Base Commander John Pugh was a friend of the family and often visited the Watsons. David was only 13 years old but his mother explained the cause of the crash. David recalls that planes were left dispersed on the field, as opposed to being put in hangers, so that in case of bombing, only one or two would be hit. This however left them susceptible to the weather and of course the Oxfords were of largely wooden construction. The rudder in particular had some steering arrangement which made use of wooden pins. The weather caused them to swell, such that when the pilot turned hard one way or the other, the rudder could jam, causing the pilot to lose full control of the aircraft resulting in loss of height and probably circling or spiraling into the ground. David has always understood that at least one, possibly two instructors had already been killed in Shropshire as a result of this fault. Reeder and Watson were next and it was not until the same thing happened to a yet another instructor who somehow managed to free the rudder, that the reason for the crashes was fully understood. This probably explains why the reports say "spun out of cloud". Tom Thorne, an enthusiast who has researched over 900 crashes in Shropshire, eventually identified that the aircraft, Air Speed Oxford MP 299 came down on a farm at Steeraway just at the end of the Wrekin, however the letter sent to Robert's family suggests something slightly different. It was with deep regret that I had to inform you by telegram of your son's death. instructor and was accompanied by my senior instructor Lt. Commander Watson. instantaneous for both occupants of the aircraft. Your son was a boy of great promise and his loss to the service will be keenly felt. to you and your wife in your great loss. If there is any service I can render - I am yours to command. Robert's father was a master at a school in Banstead and he read the letter to his pupils. Over 60 years later, Ted Bond, one of those pupils, still remembers that letter being read to the class. He says " I will always remember that day as if it were yesterday." Tim Owen, a naval cadet at the time also has reason to remember the tragic accident. He says " I was on leave when the crash happened and I did not know either of the two men killed, but I was assigned to guard the body of Lt Commander Watson at Childs Ercall Hall. This was in use as the sick bay at the time and I well remember the two hour on and two hour off shifts we did guarding the body of this officer. I was also part of the firing party at his funeral at Hinstock cemetery. It's an experience you don't forget, and last year (2007) I went back to visit his grave." Mr and Mrs C.E. Reeder of "Lucerne" Wilmot Way, Banstead. Banstead Downs Lawn tennis Club, and had many friends locally. Economic Warfare. There were many beautiful floral tributes. The article above was seen by the Headmaster at Sutton County School and on the 18th January 1944, he wrote to Mr and Mrs Reeder expressing his " very deep sympathy and the sympathy of all here who knew your son". Robert's name is listed on the Roll of Honour at Sutton County Grammer School. On the 20th of October 2008 Lt Commander Watson was remembered at a reunion dinner for West Downs, a school in Winchester. Secretary Nick Hodson wrote a short biography of James Watson which was circulated to those present. 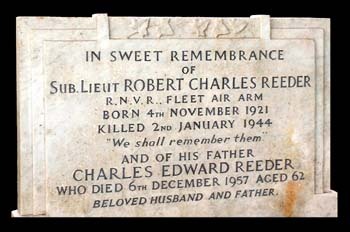 Robert Reeder was buried in Banstead and his grave lies at All Saints, west of Church. Lt Commander James CVK Watson was buried at Hinstock Cemetery. Photographs and letters kindly provided by Bob Payne, Robert Reeder's nephew. Photograph of Instructor James Watson from Ancestry.com - Directories & Member Lists > Great Britain, Royal Aero Club Aviators� Certificates, 1910-1950 > Album Pages > Album 23 certificate nos 7849-8309. Photograph of Lt Commander Watson's headstone courtesy of Avalon Eastman. Details of HMS 'Godwit' from Air-Britain's 'Squadrons of the Fleet Air Arm. Details of minor incidents from Errol Martin on RafCommands forum originally from Air-Britain's 'Fleet Air Arm Aircraft, 1939-1945'. 'Under Five Badges,Memories of Twenty-two Years in Aviation' written by Philip M.Moss. Philip was the Wireless/Communications Officer in 758 Squadron at Donibristle. When the Navy took over the Hinstock airfield Philip commmanded the advance party responsible for getting the field into shape and installing the beam approach equipment. Details about James Wwatson from Nick Hodson secretary of West Downs. Personal memories following the crash from Tim Owen. 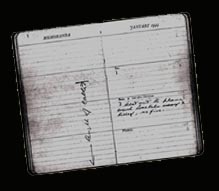 Diary entry and meories of crash site sent in by Arthur Osborne. Last update 6 Nov 2008 - added picture of Fireman's diary and report of visit to crash site. Royal Air Force Volunteer Reserve 100 Sqrn. Died 30-January-1944 aged around twenty-one. This man has not been definitively identified however there are no likely canidates other than this one, although to date no link to Banstead has been identified. Born in Portsmouth district of Hampshire in the summer of 1922, son of Bartlett John and Marjorie Rees (nee Owen). Maurice was the only child, his father born in Wales, mother in Portsmouth born and bred, father in Portsmouth by 1911, married in Portsmouth in 1917 and lived there together, both died there shortly after the war. An Owen family lived in Higher Drive Banstead but no link has yet been established. 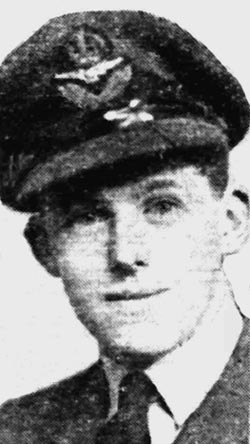 Flying Officer Maurice Owen Rees, R.A.F.V.R., only son of Mr. and Mrs. B.J. Rees, of 2 Jasmond Road, Cosham, and nephew of Councillor and Mrs H.T. Clifton, was killed on air operations in January and is buried in Germany. He joined the R.A.F.V.R. in 1940 and received his observer wings in Canada in 1942. Aged 21, Flying Officer Rees was an old Nortonian and played cricket for the school, receiving his cap. 100 Squadron was wiped out early in Jan 1942 but reformed at RAF Waltham (Grimsby) in December of that same year. The squadron was allocated 16 Lancaster MkIIIs plus two reserves for the inevitable losses. The first operational sortie took place on the 4th of March 1943, with a mine laying (gardening) operation to St. Nazaire. Both of the squadrons reserve aircraft were quickly called upon when the squadron lost its first two aircraft on this raid. The squadron was one of the stalwarts of RAF bomber Command and by the end of 1943, although losses amongst bomber crews were high, it seemed as if the Royal Air Force were in the ascendancy in the night skies over Germany. The Commander in Chief Bomber Command, Arthur Harris believed that a sustained campaign principally against the German Capital Berlin would cost Germany the War and he was prepared to suffer the loss of between 400 and 500 of his bomber aircraft to achieve this objective. The long winter nights afforded the Bombers the protection of darkness for the long round trip to the German Capital and the campaign commenced in November 1943. The night of January 30th /31st 1944 was little different from many of the previous sixteen raids on a heavily defended Berlin in the period, a target viewed with some apprehension by the crews briefed to attack it again, most as recently as two nights before. In this, the third raid on Berlin in four nights, 540 aircraft were dispatched in a 'maximum effort' raid, 446 of which were Lancasters. Casualties were heavy (again) and 33 aircraft were lost, 32 Lancasters and a solitary Halifax, with 146 aircrew killed or captured. In order to maximise the tonnage of bombs carried to the target, the route to Berlin was more direct than on previous nights and was completely direct to home from the target. There was minimal diversionary activity (a raid by a few Mosquitos on Brunswick) and worst of all there was a quarter to half moon in the night sky, a tremendous aid for the German night fighters. Amongst the aircraft dispatched to Berlin that night by 100Sqn was a brand new Lancaster MkIII - serial ND398, coded HW-B. Flying Officer Maurice Rees was part of the aircrew on this plane. ND398 had only just been delivered to No.100 Sqdn in January and as it cleared the runway at 17.13hrs on that clear English January evening, few would have predicted that it would be for the first and last time. Almost certainly the victim of a German Nightfighter, ND398 is believed to have crashed at Karwe, 8 km NNE of Karst_dt. 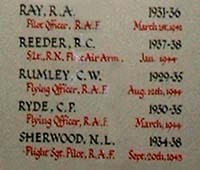 The burials of the six crewmen killed,including F/O M.O.Rees, were reported at Karwe on 4th Feb 1944. They have been subsequently been re-interred in the Berlin 1939-1945 War Cemetery. F/S Box was on his second tour, having previously served with No.50 Sqdn. His Award of the DFM was Gazetted on Oct 15th 1943. Sgt J.W.Knight survived and was interned in Camps L6/357, Pow No.1168. ND398, was one of three 100 Squadron Lancasters lost on this Berlin Raid. The Squadron's luck had changed for the worst, for before this raid, 100 Squadron had dispatched 86 aircraft sorties on six consecutive raids without loss. Of the two others, ND360 HW-N, was a more seasoned campaigner, with 72 operational flying hours. It was shot down from 21,000 feet by a night-fighter and crashed in the target area. Of those killed, two are buried in the Berlin 1939-1945 War Cemetery and four are commemorated on the Runnymede Memorial. W/O J.K.Ives KIA Sgt D.C.Cornes KIA WO2 I.F.Ruppell RCAF KIA F/S R.G.Fenton RNZAF PoW Sgt D.P.J.Savage KIA Sgt H.Johnson RCAF KIA Sgt D.Sissons KIA .Sgt Robert.G.Fenton, who bailed out from the shattered nose of his Lancaster was captured in the city itself and subsequently interned in Camps L6/L4, PoW No.1245. Finally, JB673 HW-P (which had previously served with 550 Sqn as BQ-A) and had 109 operational flying hours, was also lost in the target area, a victim of flak or fighters. None of the crew survived and all are buried in Berlin 1939- 1945 War Cemetery. This raid on Berlin was considered successful because despite cloud over the target, the damage in an area to the South of the city centre was very concentrated. The 'Battle of Berlin' as it was called, was ultimately to prove a costly failure for the RAF as it was not the knockout blow that Harris had predicted and losses were eventually to total 1,047 bombers lost, with a further 1,682 damaged, and well over 7,000 aircrew killed or captured. The last major raid of the campaign, on Nuremberg on March 30th 1944, saw the loss of a staggering 94 bombers with a further 71 damaged, out of 795 aircraft dispatched. Throughout the course of the bombing campaign in the Second World War, 100 Squadron dropped 18,108 tons of bombs in 3,984 individual sorties. Out of the 59 Squadrons in Bomber Command equipped with the Lancaster, 100 Squadron managed to fly the 12th highest number of sorties during the bombing campaign and boasted three Lancaster 'Centurions'. However, these impressive figures were not achieved without cost. The squadron lost 113 Lancasters during the War, costing the lives of 593 young men, one of whom was Flying Officer Maurice Owen Rees. Grave Reference: 7. A. 18. BERLIN 1939-1945 WAR CEMETERY Berlin, Germany. Squadron History from : The Bomber Command Historical Society. Killed In Action on the night of Jan 30th/31st 1944. All are buried at this cemetery. ( Insription on the Banstead War Memorial is C C REMANI). Royal Armoured Corps 3rd Royal Tank Regt. Husband of Betty Lilian Remané, of Bracklesham, Surrey. Clifford Remané was born on the 24th January 1913 in the district of Mengo, Kampala, Uganda. The actual place of birth is shown as Namirembe. His parents, Karl and Emily Remané were the first missionaries to go to Uganda and at that time Karl was a doctor. Clifford and his sister Nora both lived out there for a while. Emily died and is buried in Kampala and Nora and Clifford were sent to England. Karl followed sometime later and subsequently married again. Clifford left the family home and went to live with his 'Uncle Harry', Karl's brother Henry. In the 1901 census is Charles Remané aged 35 a Gold jeweller born in France living in Islington. He was Clifford's grandfather. Following on in the family business Clifford's father Karl and his brother Henry began the Remane Brothers jewellery business in Hatton Garden in the mid 1920's, although Karl didn't stay in the business for very long. At the age of eighteen Clifford first enlisted into the Royal Artillery Territorial Army where he was posted to the 98th Field Brigade. Official records show that he attended the annual camp with his unit every year between 1931 and 1937, and completed his engagement after serving exactly seven years. 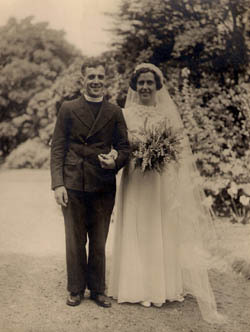 Clifford married Betty Lilian Rees on the 2nd of July 1938 at St James Church in Purley. They later moved to Banstead where they lived at Trenarren in Holly Hill Drive. This was a brand new property and, as an estate agent based in Banstead, Clifford Remané was well placed to secure it. 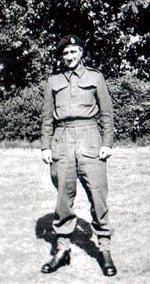 Clifford re-enlisted, in December 1940, this time with the Royal Armoured Corps. 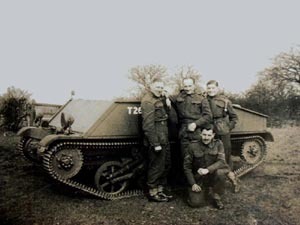 The photograph on the right shows Clifford standing in the centre in front of a 1940 Lloyd Personnel carrier No. T26529. He was immediately posted to the 24th Lancers where he was appointed Acting Lance Corporal, promoted to Acting Corporal and eventually granted the rank of War Substantive Corporal in April of 1943. It was during this period that Clifford acquired his nickname, and the events that led to this happening are recorded in a book called 'None Had Lances - The Story of the 24th Lancers' by Leonard Willis. W.A.C. Anderson Lt.Col 22 Dragoons, previously with the 24th Lancers, later wrote "I have never in my life met a better man or had a better friend. Cliff arrived in 1940 with the 24th Lancers and came to my Squadron. For the first years of his soldiering, he was my tank driver; we had some good moments together and some bad ones. When I was promoted to command the Regiment, I wanted to keep him as my driver but he was far too good a man for that and we had a long discussion about it. I finally persuaded him to take his promotion, and as a Serjeant he served under Major Bourne, one of the finest Squadron Commanders I have ever come across." 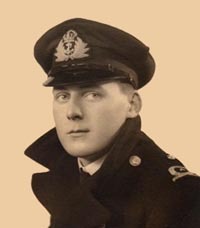 On the 1st of June 1944, Clifford embarked from the United kingdom heading for France. It was three weeks later when he was promoted to Serjeant, and on the 3rd August he was posted to the 3rd Royal Tank Regiment (3RTR). Another soldier, ex-trooper Eric Clayton remembers Clifford Remané. "Cliff Remané was not the stereotyped, raucous, beer swilling serjeant; rather he was a quiet thinking person with a courteous manner. Although he and I served in the same squadron, conversations were rare and casual, however, through working and moving in the same area, there were many friendly nods or greetings. The decade difference in age between him and an eighteen year old made him more of a father figure." Cliff Remané was a father and during his time away he never forgot his family. In one letter addressed to the eldest of his two young daughters, he says that the rabbit that he and his crew had been keeping had got too big, so he now had a puppy which was not as well behaved as the family pet back home. Cliff Remané loved animals and was a keen horse rider, a hobby now enjoyed by his youngest daughter, Faith. On the same day that Serjeant Remané was posted to 3 RTR, he was given command of a Mark V Sherman tank, and the Royal Armoured Corps Roll Book records this event. This tank was handed back and a second tank, a Sherman 17 pounder was issued to the Serjeant on the 7th August. The Roll book also records the names of the other three members of his crew as Lance Corporal Oliver, Trooper Butler and Trooper Bernstein. This particular Sherman tank may have been a Firefly which normally carried a crew of four instead of the usual five, as the hull gunner's position was disposed of to make way for extra ammunition. The hull machine gun was consequently removed and the hole plated over. 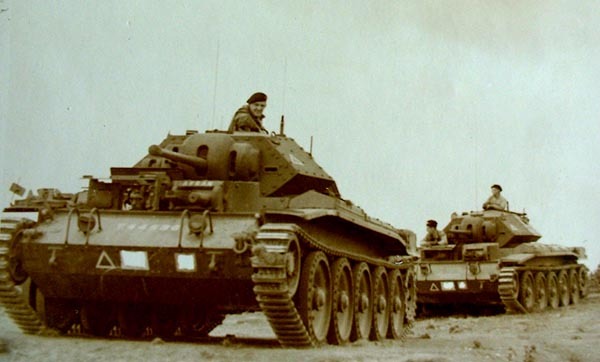 Strangely, the roll book shows a Mark 7 Sherman however Shermans in British service were designated I � V although the III was uncommon and the IV exceptional so Marks I, II and V would be the most likely. The maker is shown as Wright, and a Sherman I or II would have the Wright-Continental 9 cylinder radial engine. The Sherman Firefly was armed with a 17 pounder gun, and the machine gun would have been a Browning rather than the Besa which was pre-printed in the log. The roll book was retained by its original writer, Troop Sergeant Harry Dews, long after the war ended. Harry, was responsible for keeping the troop Roll Book and it was started with the 24th Lancers (3rd Troop 'A' Squadron). When the 24th Lancers were disbanded in late July 1944, Harry continued to keep the Roll Book up to date although the complete Troop had by then been transferred to 3RTR where it formed 3rd Troop 'C' Squadron which Serjeant Clifford Remané belonged to. The very last column of the log records the fate of the tank - Destroyed by enemy action 29/8/44. By this stage of the War, the Sherman was completely outclassed by the German tanks and it was a no contest in a one-to-one situation. The British forces called it the Ronson after an advert for a lighter which included the slogan Lights up first time every time. This description was based on a design weakness of the Shermans wherby the ammunition store was immediately behind the weakest part of the tank. The tank however had the capability of being mass produced and in the end sheer numbers won the day. Serjeant Clifford Remané never experienced the victory as along with one of his crew, he was killed in action only 26 days after his posting to the regiment, at the village of Mainneville in Normandy. Locals recollect that the Germans had been working feverishly and had dug individual holes and trenches on the road from Sancourt to Feularde. At about 4.00pm, two Panther tanks, part of the Leibstandarte S.S.Adolph Hitler, an elite German unit originally set up to be Hitler's bodyguards, took up positions; one at the exit of the village, and the other at the side of a small chapel where it had a clear view of the road and the side of the hill up to the wood where the German infantry was in position. The War Diary for the 3rd Royal Tank Regiment at Mainneville for the 29th August 1944 records that having crossed the Seine at Vernon, 3 RTR, in 11 Armoured Division, headed north east towards Gournay on the River Epte. Mainneville is one of a group of villages on the Gournay road which was the centre line of the Divisional advance. The tank regiment ran into a fair amount of opposition around Mainneville and tried to find routes around it. At approximately 19.30 hours, according to the War Diary, RHQ, A and B Squadrons are across (they don't say across what) and B, turning north west to rejoin the centre line, comes under fire and loses three tanks; meanwhile C Squadron, south of Mainneville "push on and lose three tanks". No casualties are listed but clearly Serjeant Remané was in command of one of the three tanks of C Squadron. The photograph below shows the battle scene: C squadron was assigned to cross the field on the right hand side and draw fire from the German tanks allowing others to get through safely. Serjeant Remané's Sherman tank was hit by a round fired from beside the Chapel, and it was instantly disabled. The only possible cover was a nearby haystack. Serjeant Remané had two daughters and one, now Mrs Faith Bedford, has conducted a lot of research to establish the exact events that led to her father's death. The letter from the Army to her mother advised Mrs Remané that her husband was shot whilst throwing chocolates to the villagers from the top of his tank. Mrs Bedford has two eye witness accounts of the events on that day in 1944, as well as various letters from Army colleagues. The reality of the situation however, with the regiment under heavy fire has, not surprisingly, led to some conflicting recollections. One little boy, aged nine at the time, recounts how Serjeant Remané's Sherman tank, was hit by a shell from a German tank hidden in an adjoining field. The Sherman tank did not explode and two of the occupants (presumed to be Bernstein and Butler) escaped from the tank and and ran for cover towards a haystack. The boy remembers seeing Serjeant Remané shot and killed presumably by one of the German infantry known to have been hidden in the wood. 2/Lt J B Millar wrote to Mrs Remané on Tuesday the 5th September 1944. "I first knew your husband with the 24th Lancers and he, myself and Sgt Dews formed a happy and united troop. Never have I seen your husband hesitate or lose heart when in the face of danger and he was an example to his crew and those around him by whom he was both admired and respected. ..His death was instantaneous. The round passed through the turret and caught your husband and L/Cpl Oliver his ever cheerful operator." Referring to Bernstein and Butler, he continues "..I saw them jump out of the tank, and am hoping and praying that they are alright." There is little doubt that Lance Corporal William Dan Oliver aged 26 was killed by the initial strike. There are however other accounts of how St Remané was finally killed. One possibility is that dazed from the impact to his tank, he attempted to escape but was shot while climbing out of the turret, and fell back into the tank. This account supports the local villagers' recollections that two soldiers and their little black dog were later recovered from the tank. Another version comes from Eric Clayton, a trooper from another tank who had already reached the cover of the haystack along with several others. He now lives in Australia (May 2007) and remembers the day very well. He knew Cliff Remané and recognised him immediately. Eric later wrote a vivid description of the events he witnessed on that day. "Whilst sheltering behind a haystack, I saw a tank approaching less than fifty metres away. Suddenly it stopped and only the commander baled out. He also had difficulty in running and made the decision to flatten himself to the ground and crawl to safety. Masses of little fountains of dust rose continuously around him. As he crawled closer there was a moment of mutual recognition. Then his tense body and facial muscles relaxed as a dozen ragged holes continued to rip into his uniform." Trooper Robert William Lawson, from another troop of 3RTR, was also a casualty on that day. L/S Don Harding of C Sqn 3rd RTR also wrote to Mrs Remané on the 5th Sept 1944. He says" ..My friends and I found the bodies of your husband and two comrades and we buried them in the cemetery at Mainneville. They were given the best of burials. 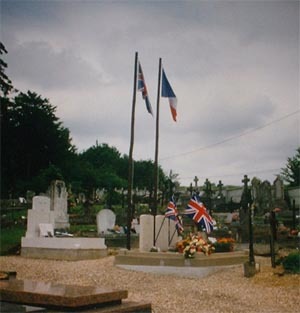 The French people of the village provided coffins and a Union Jack, and a Priest conducted the service. A woman there promised to take photographs for us and if we receive them I will post them on to you." The burial took place on the 30th August 1944 and the three men are buried in the cemetery on the hill, a little way from the church. Several soldiers attended the funeral and the photograph (shown on the left)was eventually passed on to Mrs Remané back in England along with the Serjeant's wedding ring. 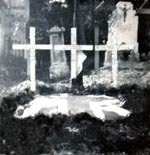 Later the temporary crosses where replaced by the more permanent wooden crosses shown on the right and these in turn were eventually replaced by the headstones erected by the Commonwealth War Graves Commission. On the 2lst June 1997 they were the focal point of a visit by Captain Stewart Montgomery who, as a Lieutenant, took part in the battles around Mainneville in August 1944. Michel Leve, the local Mayor at the time of the visit, welcomed the Captain "to this parcel of earth within the bounds of Normandy which you have, with your companions in arms, liberated, and for which you have suffered along with others who left their young lives here." The Mayor recounted the movements of the 11th British Armoured Division and the 3rd Royal Tank Regiment and described the battle of Mainneville. He finished his speech by thanking the Captain for his visit and by saluting the sacrifice which the Captain and his men had made. Mainneville is approximately 13 kilometres north-north-west of Gisors in Normandy France and the graves are in the cemetery on the hill. Mrs Bedford, who was only eight months old when her father was killed, visits the grave regularly and has high praise for the local villagers who even now, over sixty years later, keep all three graves in immaculate condition. They also hold a small ceremony on Remembrance day. 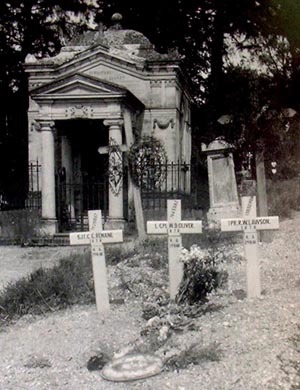 Unlike many WWII casualties buried in large Military cemeteries, these three men are the only soldiers buried in this small village; they could so easily have been forgotten however the local villagers have ensured that this will never ever happen. When Mrs Remané received Serjeant Remané's service medals, her reaction was like many other women whose husbands and sons had been killed in action; she just wanted to throw them away. Fortunately, this never happened and they survive to this day to be passed on to the Serjeant's great grandson Alfie. A special message for Alfie from the webmaster - Hi Alfie, I hope you like the picture of the medals. Your great grandad was a very brave man and his medals are very precious. You need to look after them well and always keep them safe. The name Remané has an acute accent over the e and is pronounced with a long 'a' sound at the end (same as the French sound for ait). This probably explains the incorrect spelling of Remani inscribed on the Banstead War Memorial. The stonemasons who refurbished the Memorial have confirmed that the correction would be simple to achieve and this will be arranged at some time in the future. The final tribute to Serjeant Remané comes from Lt. Col. W.A.C. Anderson of the 22nd Dragoons "I have lost a very great friend and the nation has lost a very fine man. The Lord, for some reason best known to himself, always seems to take away the best." Clifford Remané's great grandson Alfie has taken a great interest in his great grandfather's history and in November 2007 Alfie, who attends Moor Park School in Ludlow, contributed to a Year Two, World War school project run by Mrs Owen. 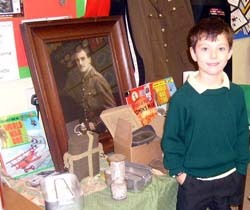 This picture shows young Alfie standing by part of the project display. Much of the research and photographs were provided by Mrs Faith Bedford, daughter of Serjeant Remané. Scans of the roll book and other historical information provided by Dr Stephen Pannell. Son of Philip Tom and Rosetta Jane Riches nee Sturgess. Husband of Dorothy Evelyn Frances Riches, of Banstead, Surrey. Leslie Philip Riches was born on the 27 June 1909 at Northumberland Heath, Erith. He was the eldest of the three children and their mother died in November 1918 when Leslie was just nine years old. Their maternal grandparents, James and Sarah Alice Sturgess raised the children. Eventually, Leslie became a minister in the Church of England. He married Dorothy Evelyn Frances Brown, born in Hertford and just a few months younger than Leslie, at Christ Church, Erith, on 7 August 1937. 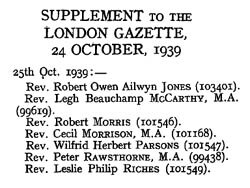 At the time of his marriage Leslie was living in Highfield Road, Luton, and was probably curate at St Mary's Luton. The couple moved to Banstead where Leslie became curate at All Saints Church. He soon became an active member of the Church Institute committee. 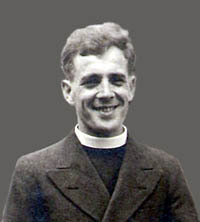 On 25 October 1939 Leslie volunteered to join the Royal Army Chaplains Department as a Captain 4th Class. He died on 1 June 1940 at Dunkirk during Operation Dynamo. During World War II, Operation Dynamo was the name given to the mass evacuation of British and French soldiers from Dunkirk where they had become cornered. It started on 26 May 1940 and continued through to 4 June. In just this short period, nearly 340,000 French and British soldiers were rescued from the beaches of Dunkirk, France, by a fleet of hundereds of vessels of every size and shape. Despite the overall success of the operation, many of the personnel waiting on the beaches, or even in the sea, were killed by low flying German aircraft strafing the remnants of the British Expeditionary Force. On the very same day that Rev. Riches died, the New York Times wrote "so long as the English tongue survives, the word Dunkirk will be spoken with reverence". Four years after Leslie's death, Dorothy married Stephen E Trinder. Personal details and photos from Peter Little, nephew of Reverend Riches. Updated 25 October 2008 with photos and personal information. To be confirmed - No known grave and registered as a death at sea. ROBERTS H W .......... Unidentified.